Villa Elena is your luxury Mykonos dream-come-true. It is a complex of two villas that can sleep 34 guests. You will find it on a land of 10.000 sqm. in Pirgi, between Paradise bay and Super Paradise beach, just a few-minute drive from the famous beach restaurants Jackie ‘O and Cavo Paradiso. 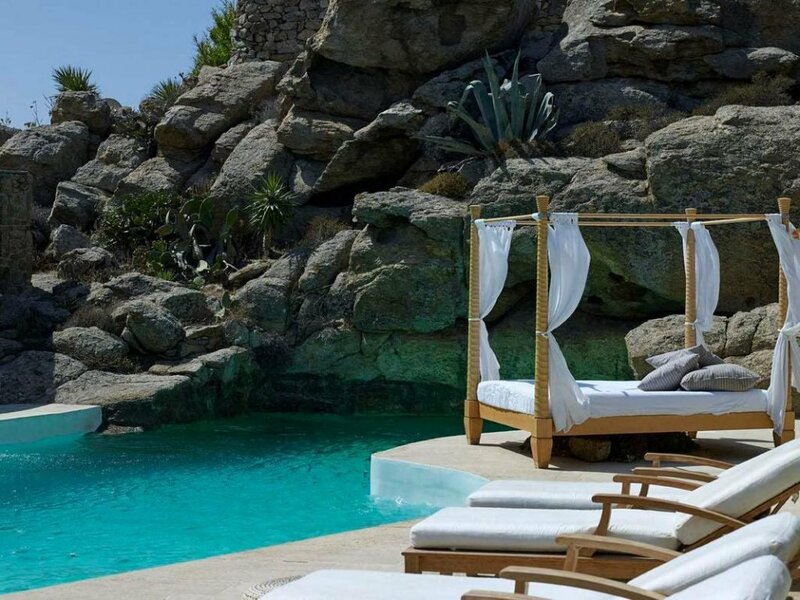 It has 230 degrees of uninterrupted sea view of the islands of Naxos and Delos. The villa can offer all kinds of facilities which make it a home away from home. What makes it unique is the two swimming pools, outdoor patio and amazing 230 degrees view. It is perfect to host a party, a BBQ dinner and cocktail night. The retreat offers a small chapel as well, which makes it ideal for a destination wedding in absolute luxury. It can host an event of 270 seated guests and there is still room for dancing! Do you dream your wedding in blue background? You found just the place!